The last vintage from one of the founding fathers of Brunello, very few wines actually deserve the ‘Icon’ status. This is one of them. 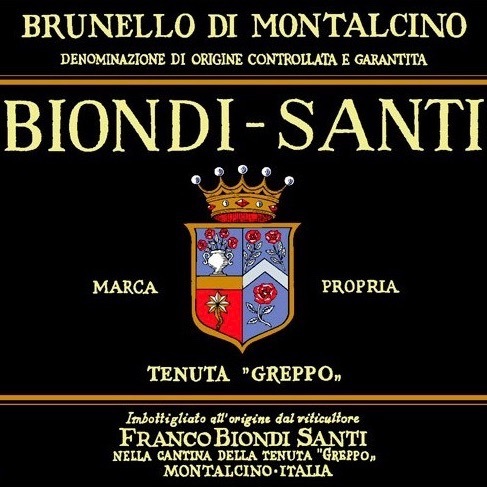 Biondi Santi (Montalcino, Tuscany): The 2012 Annata is history – it is the last Annata Brunello made by Franco Biondi-Santi before his passing in 2013. Fittingly 2012 is a great Brunello vintage…. The late great Franco Biondi Santi always said he wanted to make wines that were never old enough to drink, and the 2012 Annata we offer today illustrates how long-aging, cellar-worthy and infinitely beautiful his wines were. To enjoy a Biondi-Santi Brunello as Franco would, slowly aerate it before drinking: uncork the wine, pour out a small amount to increase the air-to-wine ratio in the bottle, and let the wine breathe slowly for approximately eight hours. Then, take your time to enjoy each and every sip. The prestige of The Greppo dates back to the 19th Century, with the great wine culture of the family that owned this Estate, whose terroir has an extraordinary vocation for Sangiovese. Clemente began making wine using 100% Sangiovese and passed his wine knowledge to his nephew Ferruccio Biondi Santi, who, after the phyloxera came in the second half of 1800’s, isolated a clone of Sangiovese that gave birth to wines of extraordinary longevity. In 1888, Ferruccio produced the first bottle of Brunello di Montalcino. The estate includes 47 hectares of land at The Greppo and 105 at Pieri. Only 25 hectares are cultivated vineyard of Sangiovese Grosso. The oldest vines, totaling 5 hectares, date from 1930-1970; 8 hectares from 1988-1989; 6 hectares from 2000-2001; the youngest vines were recently planted in 2004-2006. Fertile soils are usually not used. Marled soils with heavy stones have been always preferred by the family with southern, southeastern, eastern, northeastern and northern exposure. The yield per hectare is kept low at 3-5 tons per hectare. The current production rarely exceeds 80,000 bottles, including about 10,000 bottles of Riserva, only made after exceptional harvests. The harvest begins in mid-September and done exclusively by hand. Only the best grapes are destined to the production of Brunello, those from the vineyards that are at least ten years old for the Annata and those at least twenty-five years old for the Riserva. The second choice of grapes is used for table wine, sold in bulk. Only estate-grown grapes and wine vinified, solely, on the premises of the estate are used for production. Until his passing in April 2013 at the age of 91, Franco Biondi-Santi, known as both “Il Dottore” and the “Gentleman of Montalcino,” ran the estate, producing nearly 70,000 bottles a year of classic, traditional, collectible wines. Biondi-Santi’s lean, aromatic and thoroughly remarkable Brunellos are best known for their incredible ability to age. Even 100-year-old Brunello from Biondi-Santi shows remarkably well. Biondi Santi releases both an Annata, or normale bottling, and a Riserva bottling, making both only in good vintages and the latter only in great. While the Annata derives from vines between the ages of ten and 15 years, the Riserva derives from older vines between 25 and 80 years of age. sourced primarily from the iconic, historic Greppo plot. Grapes for both wines are sourced primarily from the Greppo plot, which consists of stony galestro soil intermixed with tufaceous clay. Biondi-Santi’s trademark aromatics and acidity, however, is attributable to the vineyard’s altitude that ranges between 1,300-1,600 feet above sea level. Both the Annata and the Riserva undergo fermentation in traditional Slavonian oak for 18 days, followed by aging in large oak casks of 800 to 7,000 liters for a period of two to three years, and the Riserva is released six years after the harvest. Underbrush, ripe berry, new leather and Mediterranean herb aromas slowly take shape in the glass. Showing youthful tension, the vibrant palate delivers red cherry, pomegranate, white pepper and pipe tobacco notes framed by bright acidity and taut, refined tannins. It already shows great balance and finesse but is still young and tight. Drink 2022–2035. Biondi-Santi is the royal family of Montalcino. The Biondi-Santis have been cultivating grapes and making wine here since at least the mid-1800’s. In the late 1800s, Ferruccio Biondi-Santi, the son of Clemente Santi and Jacopo Biondi, isolated a clone of Sangiovese, known today as Sangiovese Grosso, and began vinifying it on its own, without white grapes, as was then the custom. In doing so, Ferruccio Biondi-Santi invented the wine known today as Brunello di Montalcino. Thus begins the modern-day history.